Fur Sure Mobile Pet Grooming Mobile Pet Grooming We Come To You! You may not be aware of it, but mats are a serious problem and can be detrimental to your pets well being. Matting can restrict your pets movements, creating a veritable straightjacket and can become so tight that it can tear the skin and cut off blood circulation. Often matting will hide other problems such as sores, infections, cuts, and fleas. There is no truly humane way to remove mats as any tugging and pulling is never pleasant for an animal. Even shaving a severely matted/pelted animal requires some tugging and pulling and there are risks involved, such as cutting or nicking the skin. Most often, shaving is the only or best option, depending on the severity of the condition, and then starting fresh with a new coat and the implementation of a better grooming regime. Prevention is the key. So what causes matting and how can it be prevented? Cats can be rather greasy. They produce oil in their skin that gets absorbed by the coat and eventually causes a somewhat sticky, oily buildup. 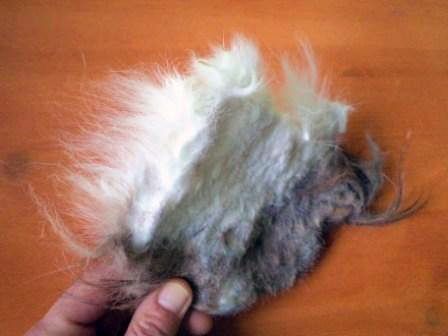 As natural shedding takes place, the gumminess of the coat causes some of the shed hair to stick rather than fall away. Very quickly a small tangle develops. Sometimes this stage can be difficult to feel with your hand. As the shedding process continues, the hair collects around the tangle, making it bigger. At this point it is considered a mat. This process continues, forming a larger mat. If left to itself, it eventually becomes a pelt, threatening to take over the cat’s entire body. When a cat is regularly and frequently bathed using the proper products (to remove the oils), and thoroughly dried and combed in a manner that helps rid the coat of excess hair, future matting will not occur. Not only does this make life better for you and your pet, it also makes them look and feel good. Cats can also be attractively trimmed and styled to prevent matting and reduce shedding. Dog mats form because hair is covered in tiny scales that can stick up and act like tiny barbs. These barbs catch shed hairs, wooly undercoat hairs, even dirt and debris, knotting and tangling until they form a solid mass of hair that is virtually impossible to comb through. They can form anywhere on the body but most often are found in the friction areas. Scheduling grooming appointments at regular intervals and maintaining the coat at home, in between visits, using the proper tools and techniques, is the foundation to keeping your pet mat free. Also, consider bringing the coat down to a shorter more manageable length. In general, the longer the coat the more grooming required. Brushing/combing should be performed several times a week. It is important that the bristles on the brush and the teeth of the comb be the right length for the coat- brushing down to the skin without irritating it. Make sure to brush and comb every area of your dog’s coat concentrating on all the friction points. Besides infrequent grooming, there can be other factors contributing to matt issues. A dogs coat is much more susceptible to matting when it is in the process of changing to an adult coat and if your pet likes to play in water, watch out- wet hair left to dry on its own without brushing, tends to stick together. Soft, silky, or double coats are just higher maintenance and much more vulnerable to the problem. Also, inferior grooming tools or products can actually damage and weaken a dog’s coat, allowing those tiny scales to become aggravated, making it far easier to develop a mat. And lastly, even your dog’s diet or allergies may lead to coat problems. A strong healthy coat relies on sound nutrition to stay in peak condition. © 2019 Fur Sure Mobile Pet Grooming. All Rights Reserved.